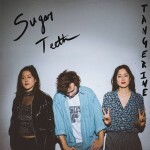 Rambunctious, rebellious and riff-laden, “Tender” from Seattle trio Tangerine will have you begging Marika Justad to take you back, if only to avoid the shaming of her euphoric yet pointed lyrics. Justad, with sister Miro and Toby Kuhn, will add to their tally of EPs released since forming in 2012 with Sugar Teeth. The followup to 2014’s Behemoth!, Sugar Teeth will be available on 19 February 2016 via Swoon Records.